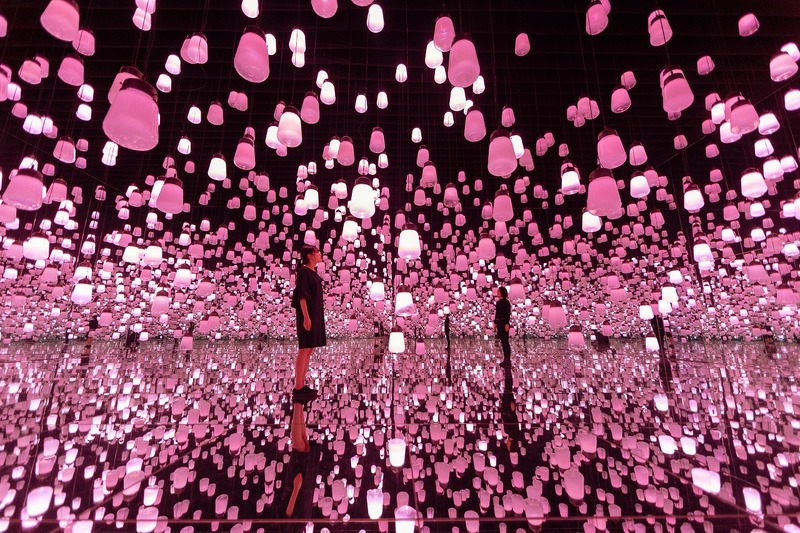 teamLab Borderless is a digital art museum co-managed by MORI Building and teamLab that seeks to create a “borderless world” made possible by digital art. For this spring only the museum has announced a limited time display that will run from early March to late May. The digital art pieces will take guests through a world of spring. Springtime flowers like Daphne odora and Astragalus sinicus will bloom in Spirits of the Flowers while plum blossoms and tree peonies will decorate Flowers – Layered Ultrasubjective Space. A spring scene will also unfold over in Memory of Topography, and Cherry blossom coloured lights will illuminate Forest of Illuminating Lamps. Two new displays will be exhibited inside Forest of Resonating Lamps – One Stroke for spring only. This includes the Cherry Blossom display with lamps lit up in that distinct pink colour and the Spring Hills & Fields display where the colours of five different flowers will radiate including four types of Japanese kerria and peach tree plants. When a person stands next to a lamp the light resonates to the next two lamps and this continues, spreading the lights across the room. This happens until all of the lamps have shone once brightly before returning to the first lamp. Flowers bloom and change throughout the year, and this rings true with this art installation. March will see the arrival of Daphne odora and in April Astragalus sinicus. Plum blossoms will be rendered through February and March while April and May will give rise to tree peony displays. teamLab explains how “flowers are born, they grow, bud, blossom and in time the petals scatter and they die and fade away. The flowers repeat the process of birth and death endlessly.” This process is recreated at Layered Ultrasubjective Space. This installation depicts a rural mountain landscape of different elevations, and from March onward will give rise to elements of spring. teamLab explains that as the seasons change so does the appearance of flowers and insects. They highlight how even if you don’t see scenery changing, including the landscapes, it always is and will never be the same twice, meaning a single moment in nature will never be repeated and can never be seen again. Experience nature and the latest technology come together this spring at teamLab Borderless. Closed: Every 2nd and 4th Tuesday of the month. Also closed February 18th-20th but open February 12th and 26th. S20 Songkran Music Festival to Make its Way to Japan for the First Time!